We are happy to now be living in a sanctuary! Lacey (larger girl) and Lemon Drop came to us after they were found abandoned,nearly starved to death, on the side of the road in a filthy wire cage . Animal Control told us that these were some of the most severely neglected rabbits they had ever seen. In fact, they were so malnourished and thin that their survival was questionable at first. Fortunately, the Petaluma Animal Shelter compassionately gave these sweet, but frightened bunnies a second chance at life. They are very sweet, but are shy---at first. 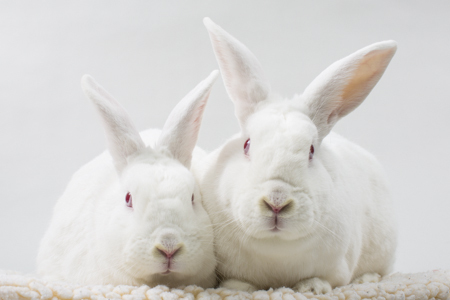 They just need some time and love They are very receptive to the Reiki energy healing they are receiving here at SaveABunny, as well as kind, loving and patient touch.